Mount Major Trail Steward, Derek Colquhoun, takes in the views on the summit of Mount Major. Autumn as arrived. As the leaves begin to change we want to take a moment to reflect on this year's exciting (and humid) summer season. 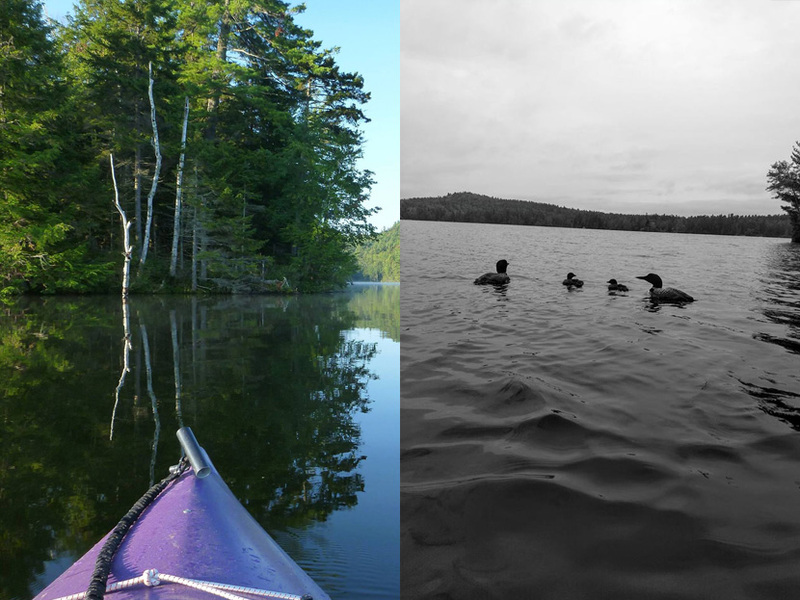 Society for the Protection of New Hampshire Forests (Forest Society) interns and seasonal staff have been busy this summer, in the woods, on mountains, ponds and trails, and in the office, too. Internships have long been a part of the fabric of the “crazy quilt” that is summer at the Forest Society (President-Forester Jane Difley even began her career as a forester as a Forest Society intern at Gap Mountain), but in recent years we've expanded and significantly improved our internship program. Eight individuals interned with the Forest Society in Summer 2018, applying their knowledge and expertise to further conservation and stewardship goals while learning new skills at the same time. Many of these internships are field-based, assisting with stewardship tasks and providing outreach to visitors at popular reservations such as Mount Major, Grafton Pond and the Merrimack River Outdoor Education and Conservation Area (MROECA). Others, such as this year’s Business Internship and Outreach/GIS internship, involve much more time at our Concord office. Filming a documentary on the Merrimack River with Jerry Monkman. Photo by Outreach/GIS intern, Kirsten Gehl. Interns Kirsten and Hannah also gained stewardship experience helping to maintain trails at Monadnock Trails Week. On the flip side, interns also develop skills during their internships that they can use in the remainder of their schooling and future careers. Hannah Boisvert, a summer Business Intern, used graphic design software to design media and promotional items for summer events. “I learned how much I like marketing this summer,” says Hannah, “ and now I’m super excited to do more of that at school.” Similarly, floodplain ranger Roger Lawrence relates that after switching majors several times earlier in his college career, his time as an intern with the Forest Society has helped confirm his choice to pursue Forest Technology at UNH’s Thompson School. Mount Major Trail Stewards like Lauren Quest (pictured) offer visitors education and information about Mount Major in Alton. Not everyone who interns with the Forest Society is at the beginning of their careers. Some, like Floodplain Ranger Ryan Paradis, are switching to a conservation career after working for years in an unrelated field. One of Ryan’s summer projects involved creating an illustrated encyclopedia of sorts for the 300+ species of plants and animals known to exist at our MROECA floodplain property in Concord. This guide is something that future floodplain rangers can download on their phones and have available to help interpret what they are seeing on the property to the public. Since he just completed a Masters degree in Environmental Science at Southern NH University (Manchester) this spring, Ryan will be looking for full-time employment this fall, hopefully in a conservation field. Ryan Paradis also created a series of educational signs for visitors to learn about flora and fauna on the floodplain. The Forest Society benefits greatly from our interns, too. We get lots of great work done, sure, but even more important than that are the great ideas and fresh perspective that an influx of new staff can bring to an organization. Interns at the Forest Society are encouraged to participate in staff meetings and events, field trips and volunteer workdays, and to let us know what they think about everything they’re seeing and doing. Everyone is learning something in a successful internship program: the interns, our members and visitors to our reservations, and the Forest Society.